I really fell for this song after hearing it performed by the Front Range Christian School Advanced Band, and it occurred to me that the version I've been holding onto by Boyz II Men for the past few years might be a good song with which to end this year's mix. I first heard of Boyz II Men back in the Spring of 1991 when they released their first single, "Motownphilly," which I loved (and still do). The members of the group met and started singing together at the Philadelphia High School for the Creative and Performing Arts. 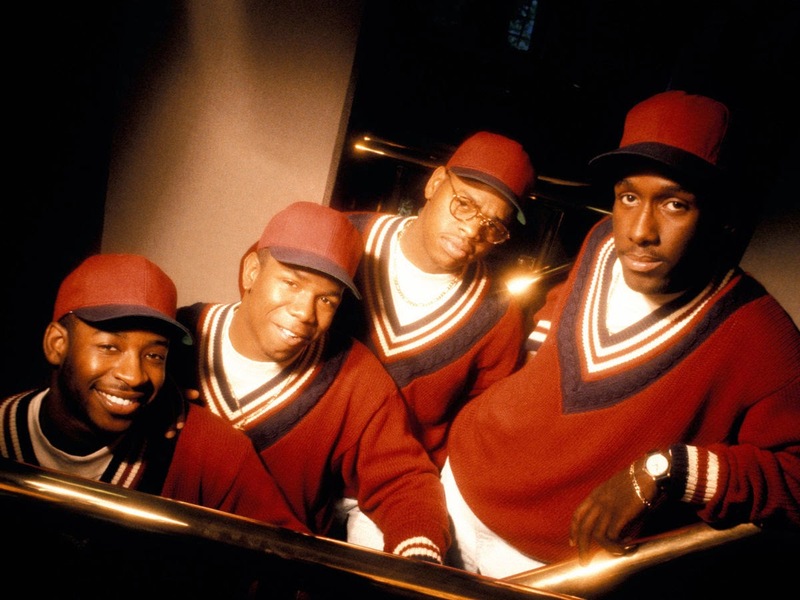 In 1989, they managed to snag the attention of Michael Bivens, the former New Edition member who'd moved on to co-found Bell Biv Devoe and was looking for new talent to promote. Impressed by their style as well as their musical abilities, Bivens agreed to manage the group, and worked with Dallas Austin to produce their first album, Cooleyhighharmony, which became a big hit and spawned three other hit singles in addition to "Motownphilly" — "It's So Hard to Say Goodbye to Yesterday," "Uhh Ahh," and "End of the Road." These three songs, each a slow ballad, came to define the group's principal style going forward. That style proved to be extremely successful, but it lacked the energy and kick that marked "MotownPhilly," and I quickly lost interest in the group, even as they became one of the most successful acts of the day. These guys must like Christmas, as they've released two full albums of holiday songs. The first was the follow-up to Cooleyhighharmony, titled Christmas Interpretations. I can't think of another group offhand that released a holiday album as their sophomore release. "Oh, Come, Oh, Come Emanuel" appears on their second Christmas album, Winter/Reflections, which was apparently only released in Japan in 2005. Both of their holiday releases are good, although neither breaks any new ground. I should note that Boyz II Men adopt a different form of the song's title than the Front Range Christian School Advance Band. Boyz II Men use more commas in their version and spell Emanuel with one "m" ("Oh, Come. Oh, Come Emanuel"). The Front Range version omits commas altogether and adds a second "m" ("Oh Come Oh Come Emmanuel"). I have no idea which version is correct (if either is), so I decided to use each group's version in connection with its respective track. I've never been a big fan of show tunes or Broadway musicals; it's not that I especially dislike them — and there have been several (Rent, in particular) that I've truly enjoyed — it's just not been my scene. 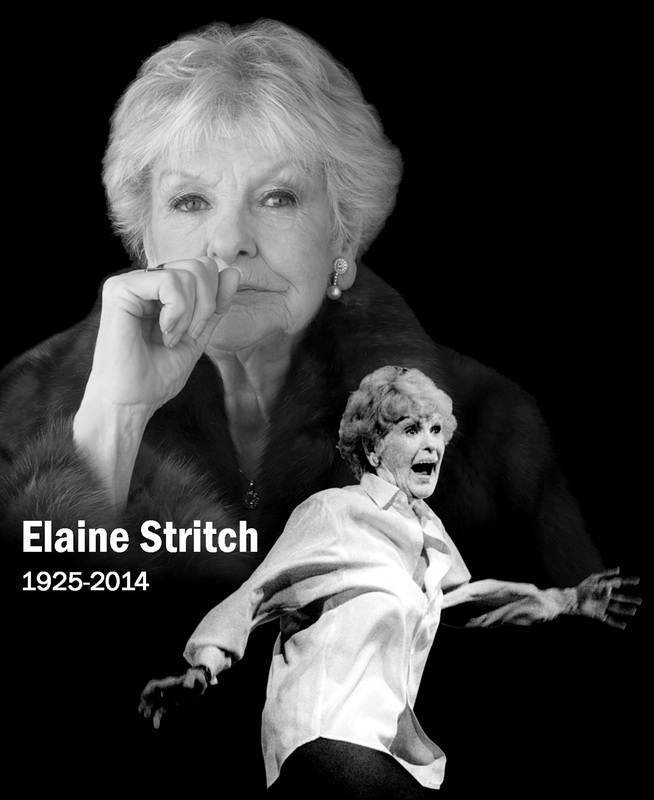 But I've always been keen on Elaine Stritch, who struck me as one hell of a dame. I first took notice of her maybe 25 years ago during one of the many pledge weeks for our local public television station, WGBH (Channel 2) in Boston. I loved Channel 2 growing up. One of the kids on our block (Tracy) was on the popular kids' show Zoom!, and the Channel 2 Auction in June was always a signal that summer had arrived. Anyway, during that one pledge week, the station was giving away a tribute to Stephen Sondheim and aired a clip of Stritch singing her signature song "Ladies Who Lunch" to promote the deal. It blew me away. She looked to be about 102 years old at the time, but her voice was amazingly strong and she sang with a level of emotion and feeling that simply impressed the hell out of me. That song was from Sondheim's 1970 show Company, in which Stritch played Joanne, a cynical, outspoken older woman who drank too much. From all accounts, she was well-suited for the part. Raised in suburban Detroit, Stritch's parents were extremely comfortable and devoutly Catholic. Her uncle was the Archbishop of Chicago. She took her first drink at 14 and quickly developed a taste for the stuff, and, with it, a passion for performing. After graduating parochial school, she left for New York and began the customary long, hard slog toward stardom. For Stritch, however, things moved relatively quickly. Tapped as Ethel Merman's understudy in Call Me Madam, she assumed Merman's role in the touring company version of the show after first playing a key role in Pal Joey. In 1961, she was selected for a part in the Noel Coward musical Sail Away, and quickly stole the show. In fact, Coward was so impressed that he wrote the other female lead out of the play altogether and combined her part with Stritch's. is in a class by itself, a biting, hilarious and even touching tour-de-force tour of Stritch's career and life. Almost every nook and cranny of "At Liberty" holds a surprise. Turns out she dated Marlon Brando, Gig Young and Ben Gazzara, though she dropped Ben when Rock Hudson showed an interest in her. "And we all know what a bum decision that turned out to be," she says. And then there were the shows. A British writer recently called Stritch "Broadway's last first lady", and when you see her performing her signature numbers from Company and Pal Joey and hear her tell tales of working with Merman, Coward, Gloria Swanson and the rest, it's hard to argue. Especially since she does it all dressed in a long white shirt and form-fitting black tights. It's both a metaphor for her soul-baring musical and a sartorial kiss-my-rear gesture to anyone who thinks there isn't some life left in the 76-year-old diva. "Somebody said to me the other day, 'Is this the last thing you're going to do? '," says Stritch. "In your dreams! I can't wait to get back into an Yves Saint Laurent costume that isn't mine – but [that] will be when the show is over." Marc Peyser, “A Stritch in Time,” Newsweek (February 11, 2002). Stritch continued to act on stage for another decade after At Liberty — for example, succeeding Angela Lansbury in the revival of Sondheim's A Little Night Music. She won three Emmys for her television work during this period, most notably for her role as Colleen Donaghy, the mother of the character played by Alec Baldwin on the hit NBC series 30 Rock. She also performed cabaret at the Carlyle Hotel in New York, where she lived until relocating to Michigan in 2013 to live with family. She died on July 17, 2014 at the age of 89. I wasn't able to find much in the way of Stritch performing Christmas-related material, but she did shoot two very funny Christmas episodes of 30 Rock and joined Jane Krakowski and Alec Baldwin for a sweet version of The Christmas Song, from which I've added Stritch's part. You should be able to hear the whole song HERE. Well, that's it for this year's mix — and not a moment too soon. Santa has already taken to the skies to begin his long night of work, and I'm hoping he can find a way to sprinkle a little love, compassion and empathy over our heads this year in addition to the toys and gifts I know he has. Those qualities are in woefully short supply. Labels: Boyz II Men, CD Notes, Elaine Stritch, Is There Really a Santa Claus?, R.I.P. 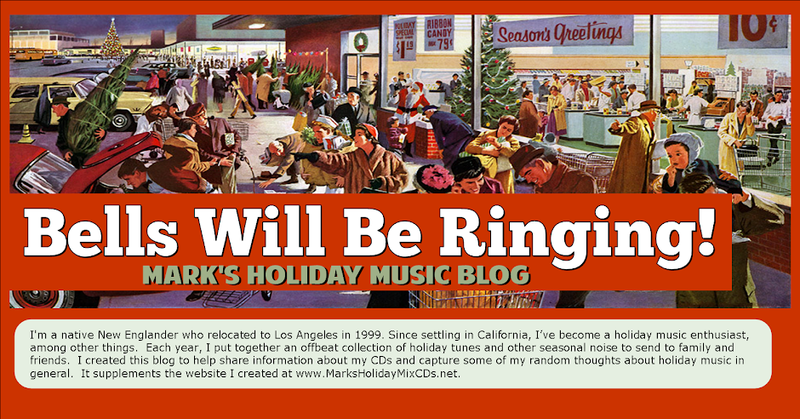 Click above to visit my holiday music website, featuring info and audio from my previous holiday mixes! JINGLE BELL ROCKS is a film that explores the fascinating underground world of alternative Christmas music. Click above to learn more about showtimes and how to order. Readers of this blog should assume that each of the songs, videos, albums or other media mentioned or reviewed in this blog has been provided at no cost for promotional consideration, whether or not that is actually the case. No payments of any other kind are requested or accepted here. Please note while we are always pleased to receive suggestions about holiday music and related material we might promote on this site or include in our annual holiday mixes, it is not always possible to acknowledge or respond to every submission. Thank you for understanding. This blog does not collect information directly from its readers, although our hosting service collects information concerning referring websites, and the nation and computer operating system type of users in the aggregate. Users are free to submit comments to individual posts subject to the understanding that these comments may be posted if deemed appropriate by the blog's owner in his sole discretion. Readers under the age of 18 have the right to request removal of any comments submitted for posting and such comments will be promptly removed upon receipt of such requests. Readers under the age of 13 are not permitted to post comments.